This gown makes us blush! This pink bridal gown by Jasmine Couture is chic and straight off the runway. The dress consists of a smooth, matte satin body which is highlighted by a ruched side detail below the left hip. 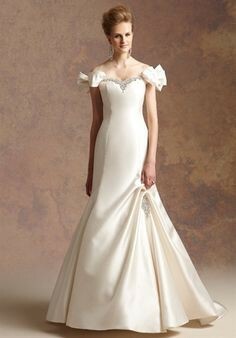 Crystals and rhinestones embellish the gown along the sweetheart neckline and at the side pick up. Crystal floral buttons finish the back of the dress and trail all the way down from top to bottom! The gown also features two off the shoulder straps with elastic backing for a secure hold - they will not slip down! Straps can be easily removed for those who want a strapless gown. The dress has a built in corset and bust cups for a very secure fit. Once you send a message, New can invite you to purchase the dress.